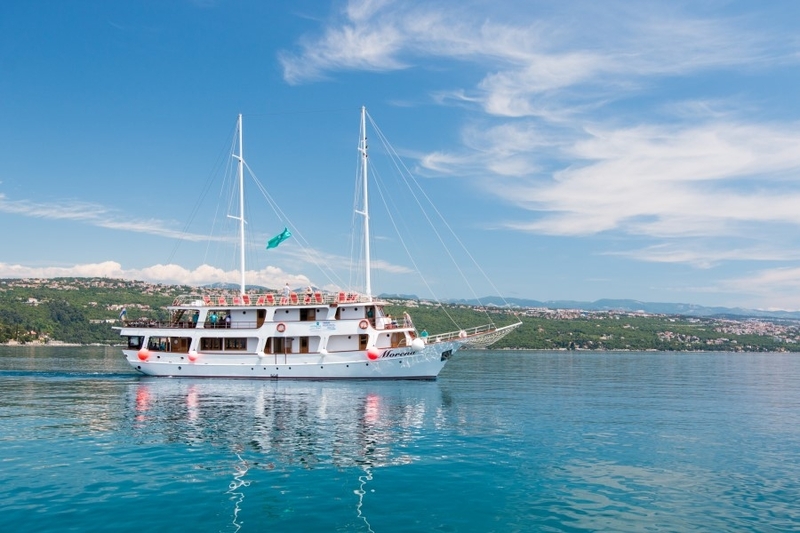 Cruise aboard a very comfortable small ship to explore Croatia's coastline. You'll visit picturesque islands, charming cities, lovely small ports and a few hidden gems on this very relaxing cruise. You will explore stunning Kvarner Bay and its islands as well as the beautiful city of Zadar. Spend your mornings admiring the spectacular scenery, enjoying swimming in crystal clear Adriatic sea and your afternoons and evenings exploring old historical towns or indulging in late nights in some of these beautiful port towns. Embark in Opatija at the foot of Učka mountain. Built at the turn of the 20th century, Opatija has been a popular destination for tourists for 100 years. Well-maintained public gardens, the illuminated 12-km-long coastal promenade, cafes, villas, hotels and plenty of opportunities for shopping and excursions make Opatija an ideal destination. We will also spend a night in beautiful Mali Losinj. Due to excellent climate Lošinj was proclaimed as a climatic health resort by a decree of the Ministry of Health of the Austrian-Hungarian Monarchy in 1892. Soon it became a popular holiday destination of the Austrian-Hungarian aristocracy, who built numerous villas and summer residences on the island. Losinj archipelago is famous for dolphins, which you will probably see during your cruise. 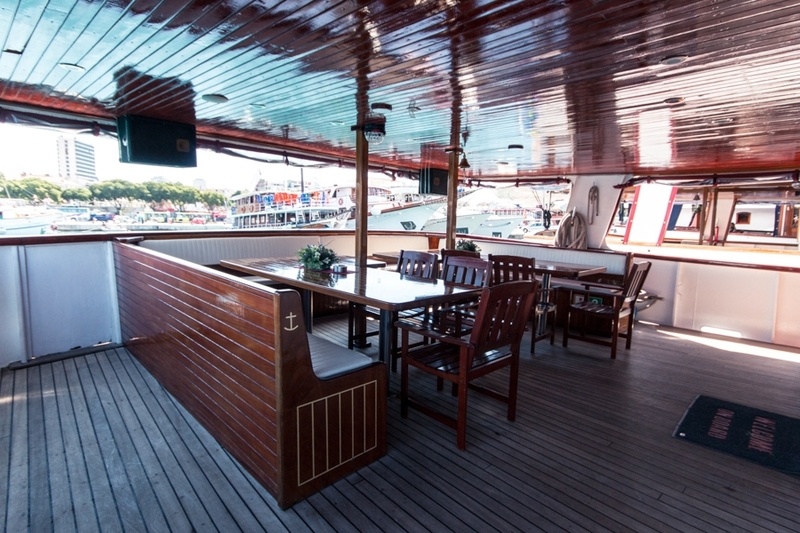 These twin or double cabins are all situated on the waterline, below the main deck. 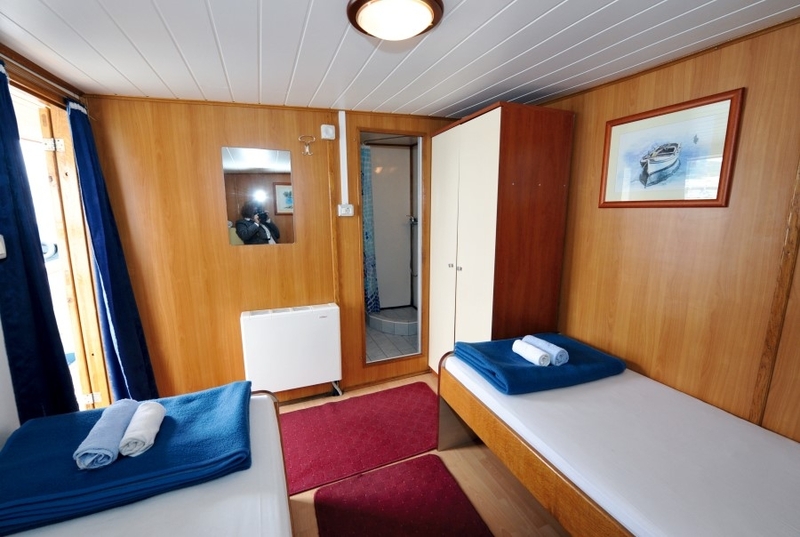 All cabins have en-suite bathrooms and air conditioning, safes and hair dryers, and wifi is available on all vessels. Some cabins have the option of a third bed. Daily cabin service, mid-week fresh set of towels and bed linen. All cabins, either twin or double, have en-suite bathrooms and air conditioning, safes and hair dryers, and wifi is available on all vessels. Some cabins have the option of a third bed. Daily cabin service, mid-week fresh set of towels and bed linen. These cabins are either on the main deck or upper deck. NB THE IMAGE OF THE ON OR UPPER CABIN IS A SAMPLE - CABINS VARY FROM VESSEL TO VESSEL. Your vessel will leave at 13:00 - Lunch will be provided on board and we will stop for a swim in the crystal clear sea en route to Krk Island - Croatia's largest island. Krk has immense variety in its villages large and small, mixing gentle green promenades with bare rocky wilderness, tiny islands and hundreds of hidden bays and beaches. Evening at leisure to enjoy numerous cafes and restaurants alongside the waterfront. Overnight in town of Krk. We cruise to Rab Island, known as the “island of love”. There will be time for sightseeing of the old town with its medieval walls, Romanesque church towers, churches, palaces, stone streets and ancient facades. Enjoy the “gallery” on the streets and squares and try famous “Rapska torta“ cake, it is a must. If the time allows walk up to Kamenjak Hill to enjoy the magnificent sunset. Overnight in town of Rab. Cruise from Rab towards Zadar along Pag Island with a swim stop on tiny Maun island. Take an optional guided tour of the Zadar, which was for centuries the metropolis of Dalmatia, and today is the centre of the region. Zadar is rich in monumental heritage of world importance. You can see the Roman forum, built in the 1st century AD, the 9th century church of St. Donatus – the most famous medieval basilica and the symbol of the city, the mighty city walls with representative Port and Land gates from the 16th century AD, and numerous palaces & villas. The town is full of great restaurants. Of special interest are the famous Zadar Sea Organs, one of a kind in the world and “The Greeting to the Sun” light installation. Overnight in Zadar. 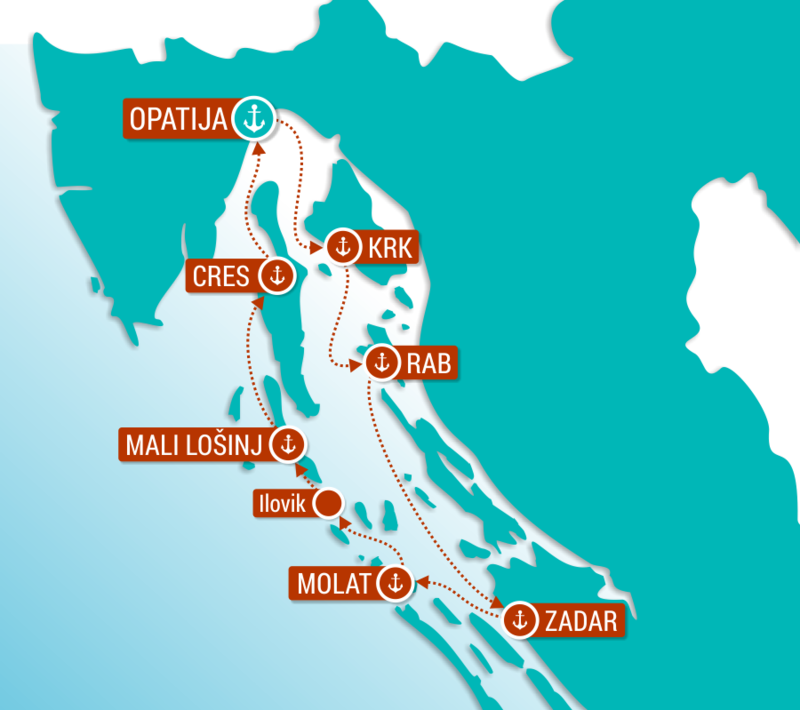 We will leave Zadar quite early to cruise to Molat or Olib island (depending on available space in the small harbours). Both islands are situated in the northern part of Zadar's archipelago, more peaceful and serene that Zadar. Captain's dinner party on board and overnight. After breakfast and a morning swim, cruise towards Ilovik, the island of flowers, for a short stop before departing for Lošinj Island, one of the most popular islands on the northern Adriatic due to the abundance of pine trees and clear waters, and its endangered population of bottlenose dolphins. Mali Lošinj, known as the “sunshine island”, has spectacularly good ice cream. On arrival take a walk along the harbour or walk up to the Lošinj Aromatic Garden or simply visit nearby, picturesque, town of Veli Lošinj. Overnight in Mali Lošinj. After a morning swim leave for Cres Island, a long and narrow island covered with oak, beech and pine forests as well as vineyards and olive tree plantations. Cres and Mali Lošinj used to be one island but a channel dug by the Romans separated them. Spend the night in the harbour of this typical medieval town Cres. Cres is also home to a tiny population of Griffon vultures. Cruise to Opatija enjoying spectacular views of famous Opatija Riviera as we go. Late afternoon arrival to Opatija for a stroll along the famous Franz Joseph promenade – Lungo Mare - to the numerous cafes and restaurants in Opatija or nearby fishermen's village Volosko – well known for excellent seafood restaurants, the best in the region, as well as among the best in Croatia. These 'comfort' cruises are run on a small variety of vessels, all of very similar standard, but the actual vessel isn't usually confirmed until 2 weeks before the cruise. All of the vessels are very comfortable, and the cabins have airconditioning and en-suite bathrooms. All the vessels carry around 40 passengers (maximum). Steel hulled vessels with modern traditional look offer accommodation in air-conditioned,spacious en-suite cabins with double or twin beds, hair dryer and safety deposit box. Ships are from 29to 35m in length with cabins 8 to 14m2 in size. Included services: buffet breakfasts, three course lunches, Captain’s dinner, English speaking tour manager on board, one guided tour, daily cabin service, mid-week fresh set of towels and bed linen, luggage handling. The images here are examples of these vessels, and their cabins and decks. Spend your mornings admiring the spectacular scenery, enjoying swimming in crystal clear Adriatic sea and your afternoons and evenings exploring old historical towns or having fun till morning hours. This ......click here to read more. 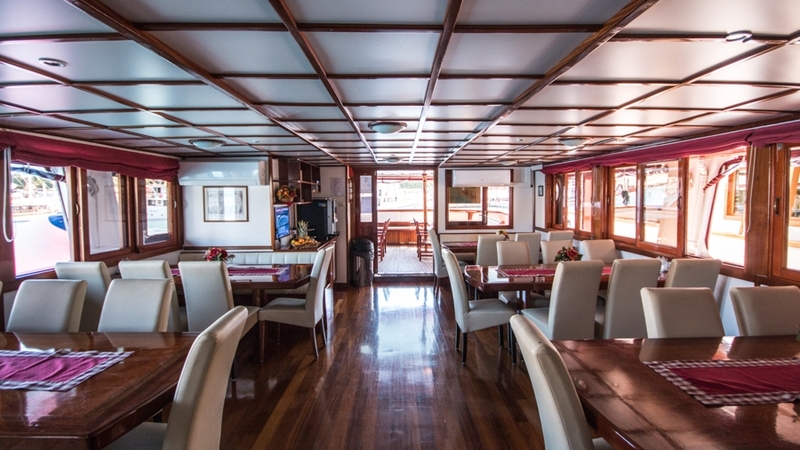 Cruise aboard a very comfortable small ship to explore Croatia's coastline. You'll visit picturesque islands, charming cities, lovely small ports and a few hidden gems on this very relaxing cruise ......click here to read more. 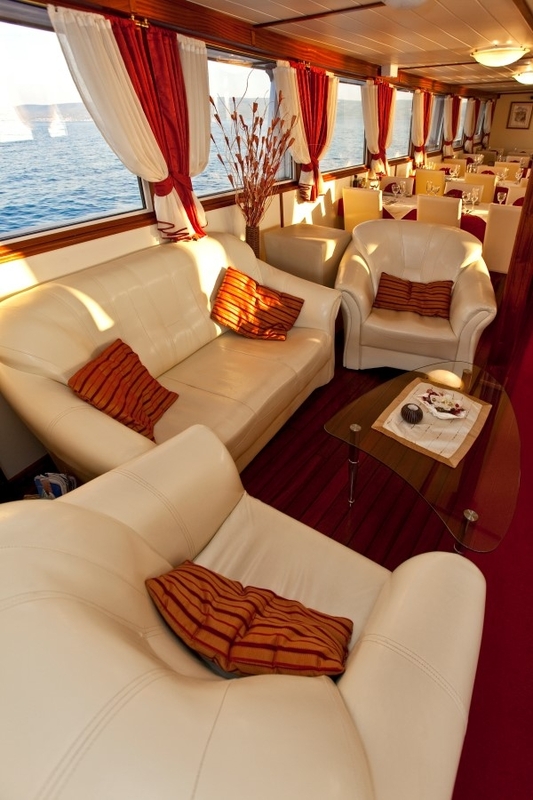 Cruise aboard a very comfortable small ship to explore Croatia's coastline. You'll visit picturesque islands, charming cities, lovely small ports and a few hidden gems on this very relaxing cruise. ......click here to read more. 2 overnights Zagreb, 1 overnight Opatija; 1 half board and 2 bed and breakfast services; accommodation in 4* Hotel in Zagreb & Opatija, Visitor’s taxes during land part, Airport transfers (from and to airport Zagreb), all transfers as per itinerary, guided sightseeing of Zagreb, Plitvice, Opatija, and on the cruise of Rab and Zadar).